The Armadillo aims to set an example for sustainable building while making New York City adaptive to a changing world through socially productive means. It is located on the East River at 14th Street adjacent to the Con-Edison power plant. Barricaded within a concrete shell during the winter and extreme weather, it is an incubator space for art, dance, theater, and science. 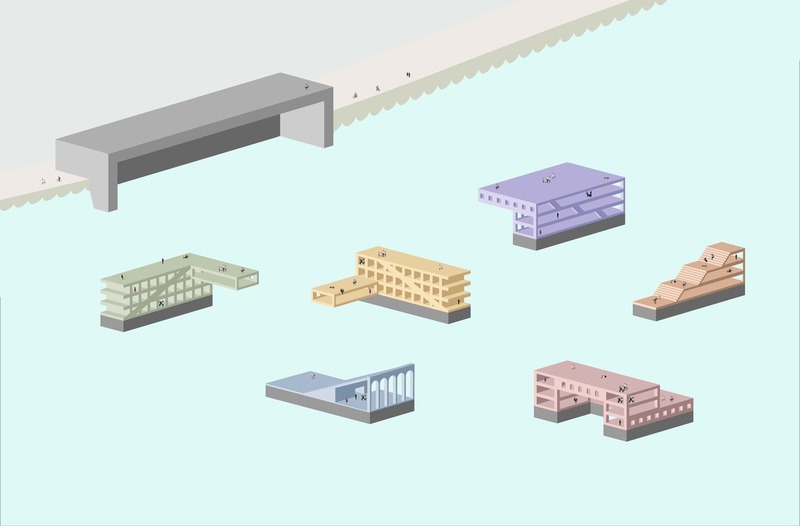 In the summer, it expands into six autonomous floating components, each with its own public programming potential as a stage, exhibition space, and more. The components dock up around NYC and North Jersey, making art accessible to various communities. The Armadillo ensures its own longevity through its adaptive concrete shell that protects the components during extreme weather. It also protects Con-Ed from storm surge. Lastly, it is a template for many similar structures to form a flood wall chain around lower Manhattan, which may otherwise be underwater within our lifetimes. 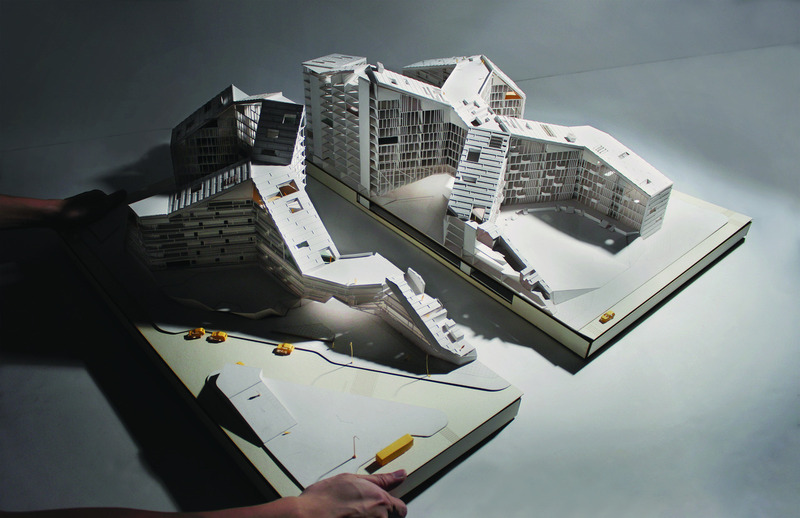 We believe sharing within a housing complex can double the fulfillment of the user by just creating half of the space. Through a series of studies on household objects, we have developed a concept of sharing based on usage and programming. Therefore, we work towards reducing overall construction area as well as increasing operational efficiency of those spaces. Thus, through the idea of sharing, this project reduces carbon footprint through eliminating underutilized appliances within the flat and relocating them in a common space, which is more efficient and social at the same time. Realizing food as a social construct, we introduce dine-in restaurants, cafes and informal outdoor areas in the public plaza. Along with the community kitchens, these spaces encourage social activities and gatherings. The coming biological age should be seen as an opportunity to reassess “sustainability”. For my project, a research complex in the sugar cane fields outside Campinas, Brazil, I’ve employed the grown material of bacterial cellulose, the leathery by-product of the bacteria commonly found in Kombucha. While utilizing bacterial cellulose is demonstrably positive environmentally, my goal with this project is to engage the non-quantifiable: the inherent politics, morality, and perceptions surrounding a new building materiality. To interrogating these manifold issues, I have created a series of narratives profiling seven different actors and their relationship to the research complex building. These narratives, each represented through their own unique media, define a scenario while also informing the design. In finding the edges of our current relationships and tweaking them, I believe we can achieve a much broader impact. Perhaps then we can begin to address climate change with the necessary urgency.